As technology and the shooting sports evolve it’s inevitable that the two paths cross in the form of virtual ranges. Once only available to military, law enforcement and well-funded shooting professionals, virtual ranges continue to push towards accessibility to the masses, but the question remains, are they valuable and worth the rental time? I headed to a local virtual range to find out. What is a Virtual Range? A virtual range acts much like a regular range in the sense that it provides gun owners the tools to practice. However, virtual ranges are unique in that they typically don’t require the use of live fire ammo or ears or eye protection. 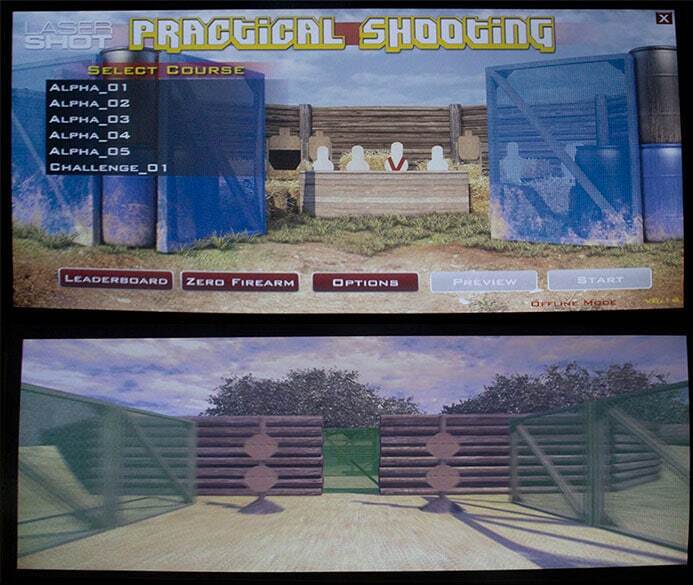 A virtual range simply projects an image from a computer onto a large screen that shooters interact with. Equipped with specially formatted weapons, shooters aim and shoot at the screen that registers projectile hits. The software provides real-time data to shooters in order to assess performance and ultimately allows shooters to improve. The feedback on the virtual range is satisfying and realistic. The virtual range creates an auditory alert when the pseudo-weapon fires and hits paper or steel targets, followed by an on-screen assessment of bullet impacts. I was provided a 1911-style pistol to test out — with a weight and trigger pull so close to the real thing I couldn’t tell the difference. 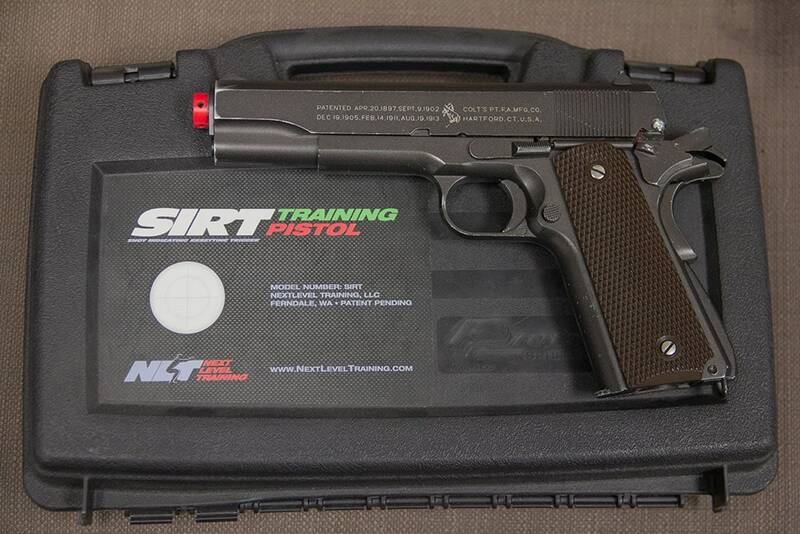 I wielded the training pistol in dozens of virtual scenarios and locations from IPSC lanes featuring steel and paper combinations to accuracy and speed drills that reminded me of old Nintendo games. The most notable benefit of the virtual range is the sheer volume one can shoot. I shot dozens of different competition scenarios without ever having to reload a mag, reset targets or policing brass. I slung thousands of virtual rounds down range in a matter of hours – an undertaking not quite feasible with live ammunition and a budget. I appreciated keeping my wallet intact instead of shelling out cash for copious amounts of ammunition and targets. Virtual ranges also mitigate the inherent danger associated with firearms. Gun owners may practice skills not permitted on standard live ranges with no risk to the shooter or range attendees. In addition, due to the quiet nature of virtual ranges, no eye or ear protection is required which is a nice luxury. While virtual ranges deliver benefits to gun owners some pitfalls do exist. The simulated range perpetuates bad handling habits and improper presentation due to the virtual nature. Though the pseudo-1911 I used looked and felt like a 1911, it lacked the proper controls associated with the real deal. 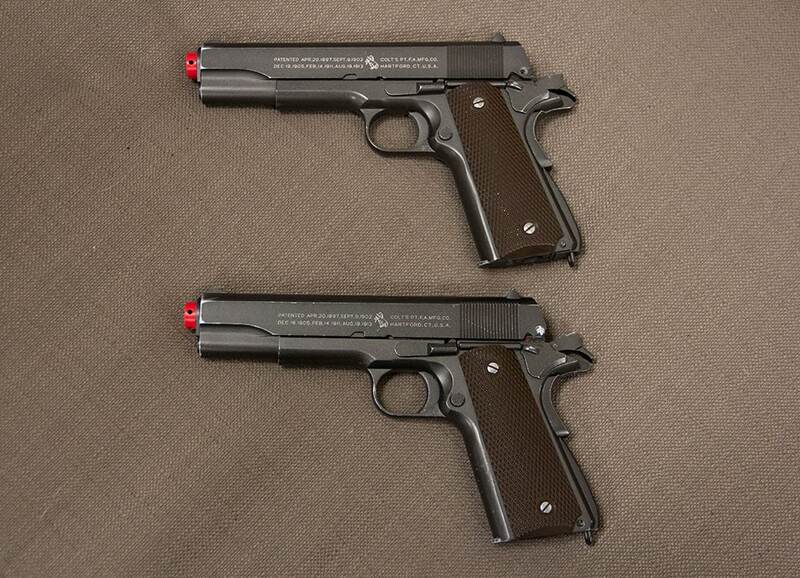 The training pistols do not require cocking the firearm or ensuring the gun is in battery. The unlimited ammo cheat is unlocked so shooters never need to reload a magazine – an unrealistic portrayal of actual shooting. I also prefer to feel some sort of recoil while practicing. This lack of recoil allows lightning fast follow-up shots in the simulator, but again, this doesn’t lend itself to real life shooting. It’s a lot easier to stay on target during rapid fire when the gun doesn’t react to the trigger pull. I could easily see some shooters lulled into a false sense of elevated skill due to the lack of realistic recoil – something that could prove fatal in a real-life situation. There are a lot of benefits to the virtual range, but also some concerns. While I don’t recommend it as a replacement to live fire training, it’s an excellent supplement to further the skills shooters are practicing at the range. Competition shooters and armed professionals would find virtual ranges a valuable supplement to live fire training due to the ability to practice transitioning between targets, proper sight alignment and the variety of drills. Socially, the virtual range thrives. It’s fun, it’s without risk and no barriers exist to prevent shooting. Whether team-building or just for fun, the virtual range offers an entertaining, competitive simulation that proves a great resource for those that lack experience with guns.